Volvos are big, spacious and lumbering, right? Not the C30, which Volvo introduced in 2006 to appeal to a new, more youthful audience. Volvos are big, spacious and lumbering, right? 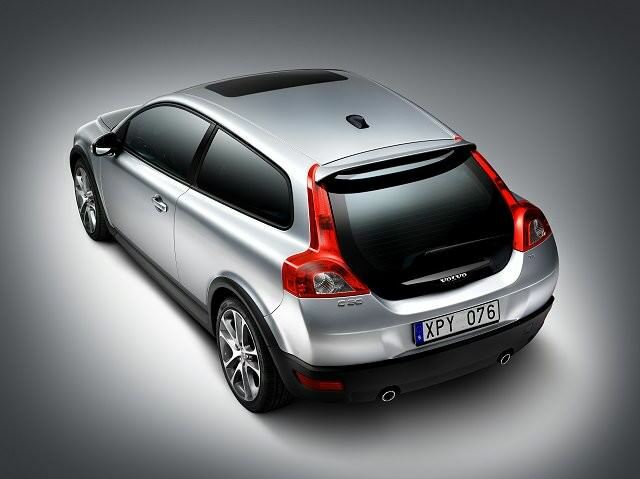 Not the C30, which Volvo introduced in 2006 to appeal to a new, more youthful audience. Out went masses of space and boxy styling for a sleek, three-door coupé-like stance. Under those svelte Swedish lines though lie some relatively humdrum mechanicals, the C30 sharing a lot with Ford’s Focus. While the rest of Europe might be offered a range of C30s encompassing everything from the base 1.6-litre petrol to a fire-cracking 220hp 2.5-litre five-cylinder engine, it’s a bit more sensible here. Scour the classifieds and you might find a 2.0-litre petrol model, but the vast majority of C30s sold here were 1.6-litre diesels. Really, it’s all you need, as despite Ford Focus underpinnings the C30 isn’t going to get you hot under the collar behind the wheel. That might be at odds with its racy looks (even more so when in R-Design trim, which brings more sporting styling inside and out), but the C30 isn’t without merit. It feels beautifully screwed together inside, the interior a demonstration of Swedish functionality mixed with restrained flair. It’s comfortable too, so long as you’re not squeezed in the rather tight back seats. You pay for those looks with a lack of practicality: the C30’s boot is not just small, but access is tight as well. Add a soft luggage cover (a hard one is available optionally and it’s recommended) that’s fiddly and Volvo really has thrown out its practicality mantra for its smallest offering. The trim choices walk up Volvo’s familiar S, SE, SE Lux, Sport and DRIVe line, the latter adding economy focused equipment like low rolling resistance tyres, wind-cheating aerodynamics and a start-stop system. That dominant 1.6-litre turbodiesel engine delivers 109hp with fuel consumption of 4.9 litres/100km and CO2 emissions of 129g/km. That engine remained on the post-2009 cars, when the C30 was facelifted, though 2011 saw power increased to 115hp and emissions drop to 94/km. It’s not worth looking for anything but that 1.6-litre D2 model, its combination of fine economy with respectable performance being a big draw. As to which trim to seek out, the R-Design model will suit those that like to be seen, though an SE won’t leave you wanting for equipment or looks. The economy gains of the DRIVe version aren’t really worth the additional outlay you’ll pay for them, and with the 1.6D SE being the most common C30 available you’ll be spoilt for choice. Accept the compromises in practicality over traditional Volvos - and plenty of hatchback alternatives - and enjoy the plentiful style the C30 brings and you’ll have a fine used purchase. Safety remains paramount, the C30 a five-star Euro NCAP car regardless of how old it is, so it’s a solid, dependable buy. Relatively inexpensive too, and thanks to fine economy that style doesn’t come with a premium day-to-day.